Ever wondered if a modern, electric cooker would be presented in a traditional way with a homely feel to it? Everhot joins two worlds together, creating a unique electric cooker that warms the kitchen. Everhot provides a traditional cooking range with hand-crafted good looks, made for both cooking and creating room heat. Available in six different ranges and fourteen different colours (Tangerine and Fern introduced in 2016/17), the brand has excelled greatly, implementing a relaxed, homely lifestyle. With Everhot, you don’t have to wait hours for the oven and hot plates to get hot to use your appliance. The neatly concealed control panel allows you to choose how hot you want your appliances. Designed to stay on all year round, the Everhot starts at 90°c, varying with temperatures, giving you freedom and ease with cooking from the tip of your finger. Each button has its own unique feature used to control the cooker. The Eco button has three modes; ECO ON, ECO OFF and ECO AUTO. When switched to ECO AUTO, each oven is pre-set to the Eco Mode on at 9pm and off at 5am. Normally used in hot weather, this setting is designed to give full cooking facilities in the day and reduced running costs. The Everhot control panel is neatly concealed as another oven door. Innovation at it's finest. Can’t decide what model to choose from? 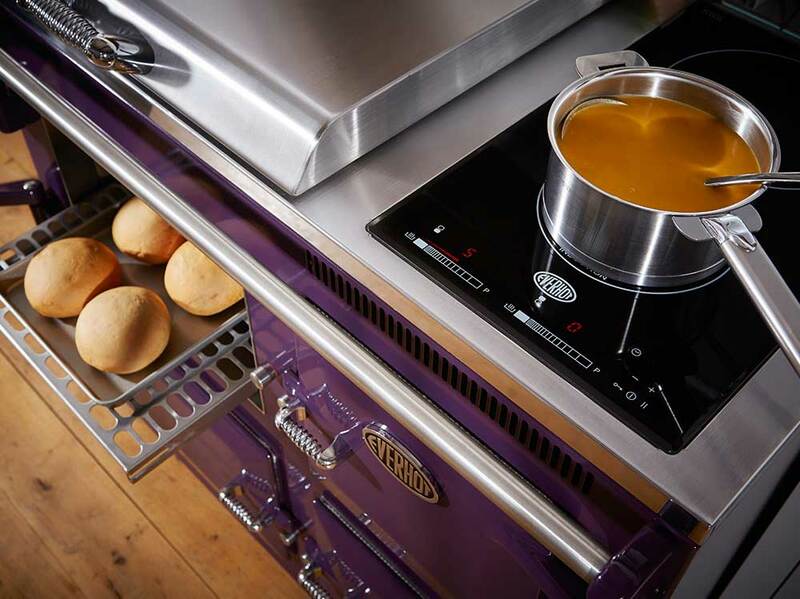 Everhot produces six different ranges of electric cookers, varying in size, colour and features. Each model varies in size, designed to fit the smallest of spaces to large areas with more freedom in design and placement. All i-models include an induction hob for modern efficiency when cooking and the + models have an additional cast iron simmer plate. The first model launched over thirty-five years ago, the 60(cm) series, is still one of the most popular models. Now expanding to 90, 100, 110, 120 and 150 models, Everhot has created the perfect cooker for every home. So why choose an Everhot cooker over a conventional electric oven? The distinctive design of a full stainless-steel interior and cast-iron exterior makes cleaning the appliance effortless. The hot plates and ovens are always at working temperature; therefore, any spilt food will carbonise and can be swept away. Not to forget the simple installation process. Everhot’s experienced installation team will precisely fit your new appliance into a selected space – all you need is two 13amp wall plugs, flick the switch and you’re ready to go! If you’re still not convinced by the energy-efficient Everhot cookers (I’d be surprised if you didn’t find them as intriguing as they are! ), come down to our showroom and have a look at them in action for yourself with live demonstrations and an in-depth run-down with our experienced Kitchen Design specialists! Book your free consultation now at https://www.lowerbarnkitchens.com/book-now/!